Let's not get into a Donald Trump vs. Hillary throwdown. That ship sailed November 8. But let's do talk about the shout-outs that American cattle farmers got on President Trump's inauguration day. Angus steak was on the menu for the second course of Mr. Trump's first lunch as president. (Granted, the first course included lobster and shrimp, but we won't hold that against him. He is on the East Coast, after all.) And it wasn't just any steak; it was steak smothered in chocolate and potatoes. Be still, my heart. No tofu for this guy. Just straight up beef. I'm in! The dessert was none other than cherry ice cream. Not frozen yogurt. Not fruit trifles. Ice cream. 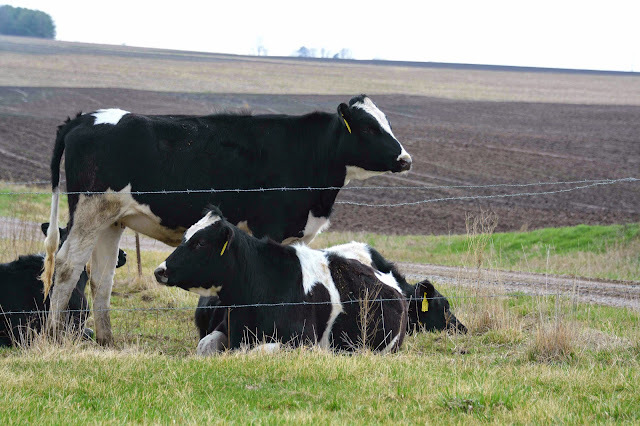 And we're grateful for the nod to dairy cows; they're part of the fabric of America too. After all, farmers have been milking cows since, well, it's probably safe to assume the Pilgrims got off the Mayflower with a bucket and a two-legged stool in one hand and a lead rope for Bossy in the other, don't you think? There were tractors in the inaugural parade. Tractors . . . in Washington, D.C., hotbed of taxis and Ubers and Amazon-drones-delivering-groceries. And the parade didn't feature just green tractors. Red, green, blue, yellow . . . they were all represented. That's bipartisanship in farm machinery in action. I vote yes in 2017. I couldn't keep tabs on all the rodeo drill teams and square dancers and pooper scoopers following horses and other country folks that were represented in the parade, but we're grateful for them too. And for each one of you! Whether you're eating beef or ice cream in the suburbs tonight, or driving your tractor or milking cows in the country, thanks for supporting America's farmers. We are grateful. My sister texted me when she saw the tractors and said, "Is this an inaugural first?" I'm not sure if it is or not, but I like it!